Hana’s public school is closing its agricultural fields, trimming back jungle around the campus and launching an education campaign to control the spread of the parasite. 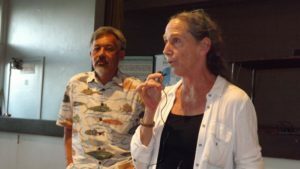 HANA, Maui – With initial shock about a spike in rat lungworm disease on Maui shifting to political debate over who will pay to contain it, a do-it-yourself effort is underway by a Hana High and Elementary School group unwilling to wait for help that may not come soon enough. Ma Ka Hana Ka ‘Ike, a construction skills program based at Hana School since 2002, is guiding teachers, administrators and staff members to safely rid their campus of rat hosts and slug and snail carriers of the lethal disease. The nonprofit’s Hawaiian name translates “in working, one learns.” It is also known as HanaBuilds. Working to contain rat lungworm germs is a learning experience for everyone involved, said Rick Paul, principal of the pre-school-through-12th-grade public school. 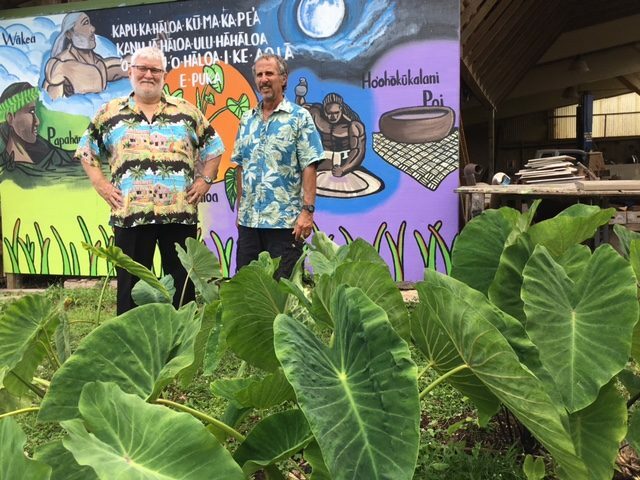 Hana School principal Rick Paul, left, and Rick Rutiz, head of a construction skills program at the school, helped craft a plan to contain rat lungworm on the campus. 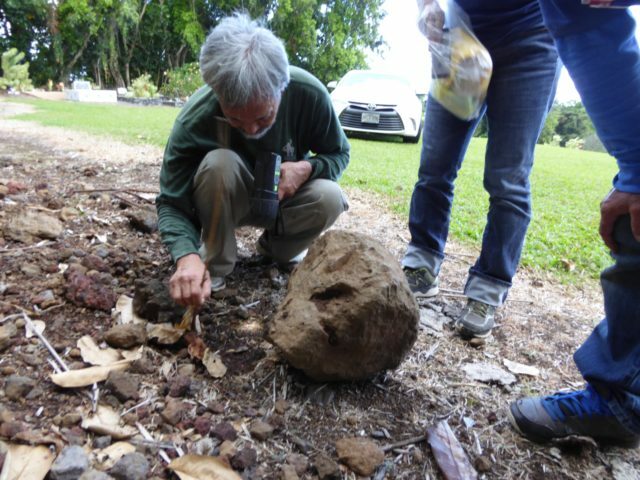 When Dr. Lorrin Pang, the state’s chief Maui health officer, brought his invasive species team to search school gardens and taro patches on April 14 they found semi-slugs, the disease’s most dangerous carrier because 80 percent are infected with the lethal parasites. Paul and Rick Rutiz, a former building contractor who started Ma Ka Hana Ka ‘Ike in 2002 as a training program in the school’s carpentry class, decided to be proactive to protect the campus and its ‘ohana. The school’s agricultural areas are now off limits to all students through the rest of the academic year. Custodians are continuing to push back a tangled jungle perimeter harboring hundreds, perhaps thousands of rats at the rear of the 15-acre campus. Rutiz is working with his program directors, Mikala Minn, head of the nonprofit’s Mahele Farm and its community garden, and Viliami Tukvatu, who oversees its education program to expand Native Hawaiian cultural practices, to craft an action plan to rid Hana School of as many dangerous pests as possible. 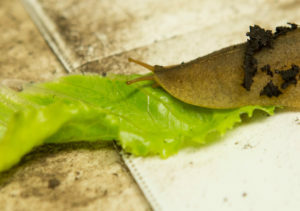 Should Hawaii Have Gotten Serious About Rat Lungworm Sooner? They have compiled a 180-page notebook covering all aspects of rat lungworm to help educate their staff, volunteers and school community. The information covers rat hosts and slug and snail carriers; safe ways to catch, kill and dispose of them; containment techniques; protocols to harvest and wash fruits and vegetables so they are safe to eat, how to protect a water catchment system from contamination, and safe weed cutting and disposal. “We put in everything we could find, anything that would help us make it safer for folks to work on the campus, and keep it clear,” said Rutiz. Principal Paul, Rutiz and his team are setting a proactive example of how to try and get in front of a health threat before it reaches an out-of-control tipping point. 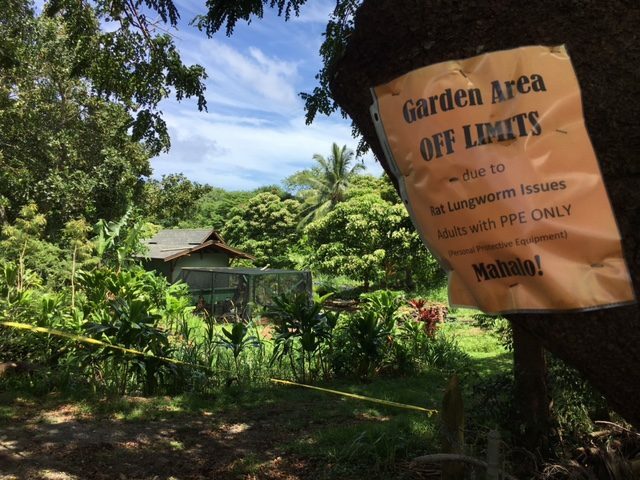 The gardens, taro patch and banana fields at Hana School are closed to students because of the threat of rat lungworm disease. “What’s happening here is putting our core mission at risk,” said Tukvatu. “Working as a team, we are going to do what we have to do to create a buffer zone on campus. Minn, a 2003 Hana High graduate and president of the Hawaii Farmers Union United-Hana Chapter, is frustrated at the lack of physical resources currently available on Maui. “Rats are very hard to kill,” he said. “We need at least 100 traps to clear a 200-yard radius around the growing areas. I couldn’t find any traps when I went looking in Kahului, they were all sold out. Same with slug bait. 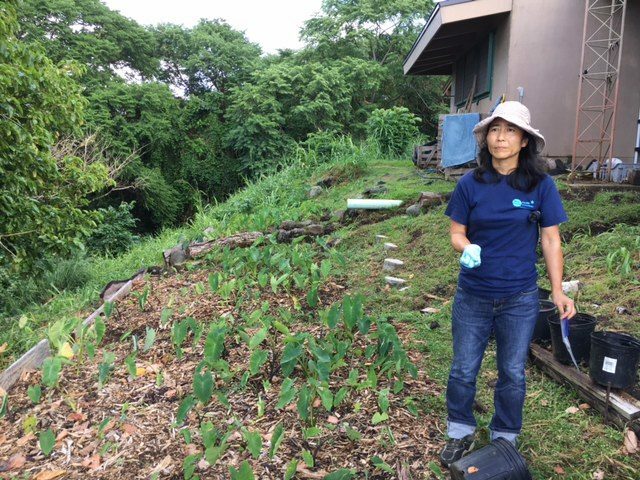 Takako Nakaaki, a state epidemiological specialist on Maui, collecting slug samples in a taro patch at Hana School. Ma Ka Hana Ka ‘Ike is committing emergency funding to buy, when they arrive on Maui, lots of rat traps, slug bait, slug jugs, nitrile gloves, tongs, disposable chopsticks, and other basic equipment necessary to trap and kill rats and slugs. Since January, 10 cases of debilitating illness carried by rats and transmitted by snails and slugs have been reported on the island. Victims include three Hana residents and a California couple who honeymooned there. 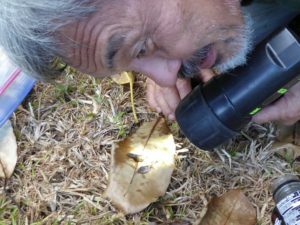 Dr. Lorrin Pang, Hawaii’s chief health officer for Maui, searches for semi-slugs, considered among the most dangerous carriers of rat lungworm disease. Maui Sen. Kalani English has asked a conference committee considering a Senate Bill 272 to pay for more research of rat lung disease on Hawaii Island to add $300,000 to the bill for emergency funding for Maui. English also is racing the legislative clock to get Pang’s $355,000 request to the Department of Health to pay for semi-slug research on Maui. “The issue is, are we going to try and keep it from spreading from Hana to the rest of Maui?” Pang said. “We need money to survey where the slugs are, pay overtime for vector control and MISC, educate growers and people who work in restaurants where most tourists eat, as well as school kids and the public. We don’t know who will provide it. Read about how the state is responding to the growing number of rat lungworm cases. 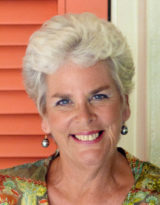 Tad Bartimus is an award-winning journalist and author and founder of the Journalism and Women Symposium. She lives in Hana.